Depending on your mood :) finding it will either be totally fun or drive you nutso! The treasure: A full-color shot of the SHINING STALLION . Wow, this has been such an exciting week! I'm working hard on the next WILD HORSE ISLAND book so that I can do some autographings at bookstores (HORSE LUAUs!!!) starting next week. 1) If you can't find a copy of HORSE CHARMER, the first WILD HORSE ISLAND book, just put in a request. Some places, there were so many pre-orders, there were no books to buy off the shelves. Som the book went back to press & there should be plenty available asap! 2) If you haven't requested a WILD HORSE ISLAND bookmark yet, shoot me an email QUICK! Starting June 2, I'll be giving out bookmarks at my booksignings & they could go fast. Have a wonderful weekend & please play safe! Tough times lie ahead for Nevada's wild horses. There are already more horses in government pens than exist on the open range. AND MORE ROUND-UPS ARE UNDERWAY. This story http://www.klas-tv.com/Global/story.asp?S=6561329 will tell you more. "It's one of the saddest things I've ever seen. My kids ask, where are the horses going, mommy? Are they going to bring the horses back?" The rural community of Cold Creek simply isn't the same. The wild horses that used to appear nightly to frolic in front yards, graze in the open desert, or to drink water in the evenings, are all but gone. Residents still spot a lone stallion here and there, but it's not the same. I just opened my copy of THE HORSE CHARMER, the first book in the WILD HORSE ISLAND series & got a surprise. Those of you who've been wanting to see covers of the next book, SHINING STALLION, are in luck. There's a small b&w shot of it and of RAIN FOREST ROSE! 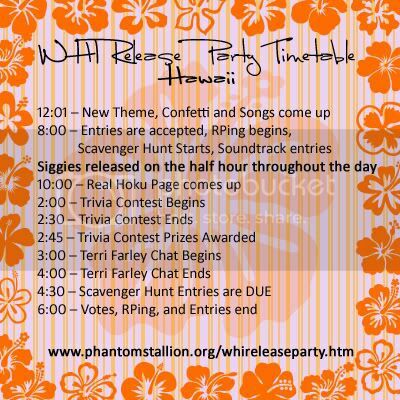 Starting at one minute after midnight, the all-day, all HORSE, all Hawaiian pre-launch party for WILD HORSE ISLAND begins at Phantomstallion.org. Besides enjoying the games, music, sneak previews and socializing with other Phantom fans, I hope you'll drop by when I do, for a live, online chat. From Sam, the hostess of this fun event: Make sure you check out www.phantomstallion.org/whireleaseparty.htm for descriptions of the events, a time table, and how to sign up. It's sure to be a blast - not to mention the TERRI FARLEY WEB CHAT we'll be hosting! Anyway, please try to make it - if you sign up before hand you'll recieve a personalized WHI Participants Siggy - and events with winners get graphic prizes. I know you've been waiting for a closer look at the Phantom's new home and TV reporter Linda Garrett has done a wonderful job of taking you there. Just go to http://khsltv.com/ and click on "video on demand" on the right side of the page, then scroll down to a story titled: RIDE OF A LIFETIME, part 2 ! Wild country, wild horses, shots of the Phantom & Pride, and Mike, a super cowboy who cooks as well as he rides! I know you'll love the most recent photos of the Phantom and his herd roaming the sanctuary! Visit: http://www.paulharmonphotography.citymaker.com/index.html and scroll halfway down the page. Think it's impossible to be an artist, horse-lover and show the rest of the world that Americans have kind hearts? Artist Susan Fox wouldn't take no for an answer and I think you'll really enjoy this article about her and Mongolia's wild Takhi horses! When you compare her artwork with the real horses (check: http://www.takhi.org/cms/index.php?option=com_content&task=view&id=28&Itemid=50&lang=en) I think you'll see she's a skilled artist of animal action as well! Even if you weren't at the Free Again Celebration, you gave watch the Phantom lead his family to freedom! As you look at the Phantom's herd, try to guess which mare will be the lead mare. Will it be Shy, the wild sorrel who ran with him on the range? Queen Zenya Dann, the striking black mare (tallest in the herd) who once belonged to two Shoshone sisters? Golden Girl the blaze-faced palomino? Baby, the six year old roan, the pickpocket of the group? Or Lily, the little white mare? I'm writing my own account of what happened at the Wild Horse Sanctuary yesterday, but here's the first (GREAT) story with super photos and I know more will be coming. There were many photographers and other media people there. What makes this one special is that the reporter, Dylan, has been following the stallion's story since he arrived at his new California home! Lucas, the photographer did a great job of capturing the spirit and beauty of the horses, so don't miss all three that are up on the Record-Searchlight's website! The Phantom is free again. What an incredible day! More -- LOTS more -- tomorow! I wish you all could have been there. Take a Virtual Trip to Nevada! A lot of you have wished you could fly to Nevada for a look around. Well, here's the next best thing: real time web cams! This site has lots of webcams set up in northern Nevada, but I recommend you check on the one in Virginia City, an old silver rush town, not far from the real Phantom's home range. It's where I went last week to hear Lacy J. Dalton sing! If you decide to explore the other webcams, remember Las Vegas and southern Nevada are way different from Northern Nevada! We have more snow & they have more sun! Think you might want to go to college near wild horse country? Have fun. I wish you were going with me to visit the Phantom! I'm getting really REALLY excited about the release of Wild Horse Island : THE HORSE CHARMER. So, I've posted a countdown "widget" on my MySpace Profile page. To find it, just look for something moving on the right side of the page. You can download it to use for yourself, or just check back when you need to know how many more days must pass before the books appear on your bookstore shelves. If you want to show me how you celebrated the release of THE HORSE CHARMER by sending me an email photo of you and your friends (or pets!) with the book and I will post it on PhantomStallion.com! Soon, YOUNG RIDER magazine will present an article about the real PHANTOM STALLION and an excerpt (longer than you'll see online) preview of the first book in my new WILD HORSE ISLAND book. Cool, huh? The Phantom in one issue and Hoku -- the sorrel star of HORSE CHARMER :) -- in another! If you haven't read the magazine, you might get an idea of what it's like, here: http://www.youngrider.com/ . The site has postcards, wallpaper, a forum, peek into the magazine and all kinds of other stuff. I just received this and thought you might be interested. Please let me know if it works out for you! There is this awesome site I wanted to tell you about! It's called Phantom Stallion Writer's Club, and it's a run-off from WHV. They have contests, a Writer of the Month, and the best part is a huge contest called PSNoWriMo, which stands for Phantom Stallion Novel Writing Month! Over the course of two months - despite the name - writers must type up a 25,000 word book. It can be a short story, novella, or even the beginning to a story. Or longer! It will take place in June and July and I know it will be awesome. The main part is the forum. I was hoping you might mention this site in your blog. It would amazing to get more of your writing fans involved, especially in PSNoWriMo! Could you possibly mention it? It would mean a lot to me and other members! Directions: Either go to www.phantomstallion.org and scroll down the page on the right-hand side until you reach Writer's Club or go to: http://www.phantomstallion.org/pswc/index.htm or even to the forum: http://pswritersclub.proboards54.com/index.cgi, which is the most active part of the site, and where all of the contests are! Thanks so much for writing and loving horses, Terri! I love the ones of him and Lily the white mare, playing in the mud! Several of you have asked me where I'll be signing books & giving workshops, so I've updated my schedule. Now it shows most of my appearances from now until October! Hope to see you somewhere!!! Last week we got good news from the House of Representatives, they voted to end horse slaughter. Now, before the Senate has had a chance to ban horse slaughter, too, a court in Illinois has give the Cavel Horse Slaughter plant the go-ahead to resume butchering horses for human consumption. I have heard horses were herded into the factory and killed today, but I hope it's not true. Here's what you can do. I've listed just ten Senators below. Please call one or more (they are either new or haven't yet decided how to vote) and ask their office to end horse slaughter in their state. I thought you might find this link interesting and fun. Fun, because you can plug in ages of horses you know, or fictional horses you like, and interesting because you can see the human equivalent of the 10-year-old horses Conrad Burns decided were too old, and ready for slaughter. You might type in the real Phantom's age (about 17) and see how old he'd be, if he were a man instead of a horse. Hmmmm...wonder how this would work with a Centaur? In just a few more days, the Phantom and his herd leave their corral for the freedom of the Wild Horse Sanctuary. I'll be watching every second, so that I can tell you what happens, and one thing I'll be hoping I can glimpse is which mare seems likely to be the lead mare. Will it be the palomino, Golden Girl? The small white mare, Lily, which Pride tags after whenever he gets the chance? Maybe it will be Queen Zenya Dann, the striking black mare of Shoshone heritage, Baby, the strawberry roan, or wild Shy, the only mare that remembers running through the sagebrush with the Phantom? Of course, it's unlikely we'll be able to tell as they pass through the gates, but I plan to go back and ride with Dianne and the Wild Horse Sanctuary cowboys this summer and I'm hoping I'll get a glimpse of them!